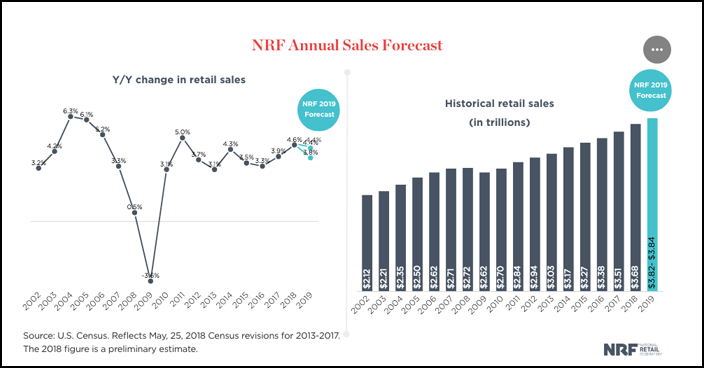 WASHINGTON — The National Retail Federation (NRF) forecasts U.S. retail sales growth of between 3.8% and 4.4% this year. If accurate, that means a slight decline from the increase in 2018, when retail sales climbed 4.6%, according to preliminary figures cited by NRF. Preliminary estimates for 2018 suggest retailers took in $3.68 trillion, a figure that includes online and other non-store sales, which increased 10.4%, but exclude sales at automotive dealers, gasoline stations and restaurants. The 2018 results are based on Commerce Department data through November and use NRF estimates for December, when the partial government shutdown interrupted the department’s data collection. Kleinhenz foresees inflation and interest rates remaining low in 2019. Retailers have so far managed to mitigate the impact of new tariffs imposed by the Trump administration on steel, aluminum and other imports from China, NRF commented. But that could change from March 1, when tariffs on $200 billion in Chinese products are scheduled to increase to 25% from 10%.